Conceptual orientation; Information literacy practice in academic libraries and the higher education landscape; Information literacy in the workplace landscape; Information literacy advocacy and the public library landscape; Landscapes of information literacy; A conceptual architecture for information literacy practice; Concluding comments. 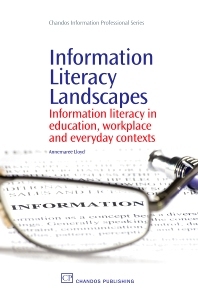 Drawing upon the author’s on going research into information literacy, Information Literacy Landscapes explores the nature of the phenomenon from a socio-cultural perspective, which offers a more holistic approach to understanding information literacy as a catalyst for learning. This perspective emphasizes the dynamic relationship between learner and environment in the construction of knowledge. The approach underlines the importance of contextuality, through which social, cultural and embodied factors influence formal and informal learning. This book contributes to the understanding of information literacy and its role in formal and informal contexts. Educators and practitioners in library, vocational and higher education sectors.